"I understand that you work hard all day and need time in the evenings to relax and unwind, but I've never pointed out to you that for you to relax and unwind by going out every night, you are counting on me to stay home with the kids, which is what I do all day. So I don't get to relax and unwind and I become more resentful toward you and the kids and unpleasant to be around. I need escape time too. I'd like us to work out a way that we can both get what we need." John agreed that Mary had become very unpleasant to be around (and didn't hesitate to tell her so.) But after a number of arguments, they came around to agreeing on an experiment. The experiment was that once a week John would go out while Mary watched the children, once a week Mary would go out while John watched the children, and once a week they both went out while Mary's mother watched their children. The other two evenings they all stayed home as a family. After two weeks of this experiment, not only did Mary feel better, but John felt better as well because he was feeling closer to his children and getting less resentment from his wife--and he still had time to see his friends. The word "compromise" does not adequately describe the process of creating a "win-win" solution. Compromise implies that neither side really gets what they want, whereas in "win-win" solutions, both sides get as much if not more than they wanted originally. Assertiveness means acting from a place of respect – for self and other – and assuming equal value to the needs of self and other. This presents many dilemmas that can also be seen as possibilities. Power--the power of creative problem solving and acting--is mobilized rather than suppressed. 2. 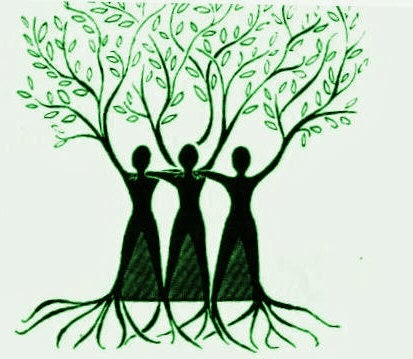 There is something wrong with the present system of power distribution for all people, which we, as women, may be particularly sensitive to, having so deeply learned to respect the importance of other people's needs. As we endeavor to compete with men as their equals, some of us feel there is something sour about climbing up a ladder on top of other worthy people's heads, something deceitful about the notion of inferiority and superiority in our fellow human beings. We see that to gain others must lose, and having been relegated to losing for thousands of years, we may not feel comfortable inducing that experience in others. When some people have less power than others do because external forces (e.g. money, status, physical strength, military force) block them, many problems arise for both the "winners" and the "losers". The "losers" become afraid to express their needs because they fear (often rightfully) that what little they have will be taken from them. They then become afraid to even feel their needs, to admit to themselves that they want something. They become immobilized. And, in certain critical ways, they stop growing; cease to thrive; development (the Power from Within) is blocked. The "winners" then miss out on the experience of sharing with equals and become self-preoccupied. Their development is also blocked. 1. How do we reclaim our rights to power and effectiveness in the world without doing so at the expense of others? 2. How can we, as women, integrate the profound knowledge we gain from mothering and being nurtured by our mothers -- i.e., that we are each special, unique, and worthy in our own right, into a culture where value is so often seen in material terms? We may want to begin by developing our own vocabulary to describe our experiences and perceptions. Without words to communicate our experiences, we are trapped and limited. If power only means the power to force others to do our will, we will feel that power is foreign to us, awkward and unfamiliar. But power means many things, and many aspects of power can feel right for us. Power Over: the ability to force others to do your will through physical or financial coercion. The power inherent in social or economic positions, or physical size or strength, regardless of skill or ability. Power From Within: the power of growth and development inherent in all living things. It is the power to change, to overcome obstacles, to face our own fears, to learn new skills, to fail, and to try again. Power can be used to destroy or create, to belittle others and over-inflate the self, or to belittle the self and over-inflate others. We may call the use of power to harm or belittle the self passive power, and to harm or belittle others aggressive power. In contrast, assertiveness can be seen as the use of power to enhance and respect both self and other. Assertiveness training, then, can be a way for women to reclaim their rights to power and effectiveness in the world without doing so at the expense of others.